Continue to grow your wilderness skills with advanced training, more practice in the field with experienced instructors, and a focus on the applications of nature skills. The Advanced Wilderness Skills Program is for individuals who have completed the Wilderness Certification Program (or an equivalent in-depth training) and are seeking to further develop their skills towards careers. 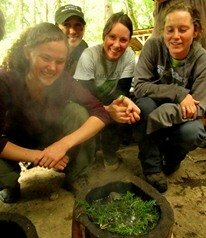 The program focuses on advanced studies and applications of each of our core curriculum areas (survival, tracking, ethnobotany, permaculture, naturalist skills, and outdoor leadership & teaching). Graduates of the Advanced Wilderness Skills Program receive certificates in Advanced Wilderness Skills Education, Wildlife Trailing, and Wilderness First Responder. Location: Based out of our campus in Monroe, WA (in the Seattle / Puget Sound Region) with field trips throughout the Northwest. (field trips include Rocky Mountains Wildlife Tracking Expedition, Survival Trek in the Eastern Cascades, Marine Ecology Field Trip to San Juan Island, Oregon Permaculture Sites Road Trip, and more). Duration: School-year schedule. Meets Fridays, Saturdays, and Sundays, 9:30am - 3:30pm, with several extended trips during 33 weeks of classes between September and June. Next course begins September 6th, 2019. Faculty & Guests: Alderleaf core staff plus guests. (guests include flintknapping expert, Dan Stueber; senior trackers, Brian McConnell & Nate Harvey; permaculture author, Dave Boehnlein; expert hide-tanner, Katie Russell; search & rescue tracker, Rob Speiden; master blacksmith, David Tuthill; expert arborist, Phil Bennett; and ethnobotany author, Heidi Bohan). See staff bios. Enrollment: Class sizes range from 12 to 25 students. Tuition: $14,950. Tuition covers all instruction and field trips. Financial Aid: Financial aid options are available including work-trade scholarships; Paramount or TFC financing; and acceptance of veterans benefits, Americorp grants, & 529 college savings plans (see our FAQ for details). Apply for a work-trade scholarship by submitting a scholarship application with your program registration. To Register or Apply: Wilderness Certification Program graduates may register directly into the Advanced Wilderness Skills Program with a $100 tuition deposit registration fee. Graduates of equivalent training may apply by writing a two-page letter of intent that describes your experience and goals in the program. 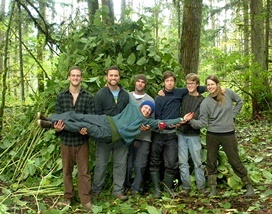 Application letters can be emailed to info(at)wildernesscollege.com or sent via postal mail to Alderleaf Wilderness College. More Information: For questions or to learn more, contact us.